Hi there! If you have read any of my recent posts, you know that we presently have an overabundance of apples here at our house and at our neighbor’s. Since we have more than we can eat, I decided to use some of my crops to create this fall centerpiece with green apples. Here is one of our apple trees! We have a large bar in our basement outside of our theater room that needed a little fall splash so that is what motivated me to create something for my island in our bar. We entertain in this area regularly, especially now that it is getting cooler outside and it is football season. Creating this centerpiece only cost me a few dollars and was super simple. I already owned the antique, french ironware platter and the birch candle holders, so the only thing I purchased was the little white pumpkins from Trader Joe’s ($.69 each!). Everything else came from my yard. It is very common for me to bring the outdoors in, especially in the fall! Living in Colorado, I have an unending supply of pine cones and evergreen shrubs and trees. I especially love using my sedum (shown here) at this time of year. First, I pulled out my platter and placed the two birch candle holders from Cost Plus World Market. You could easily use any kind of platter or dough bowl. Next, I added in the apples and white pumpkins. Some of my green apples actually have a tint of blush pink in them and I just love them. Juniper or cedar (or any other evergreen plant) works great for this application because it stays green for so long without water. I use it all the time in my fall and winter arrangements. Finally, I added in the pine cones and sedum. The warmth and texture of the sedum worked so nicely. 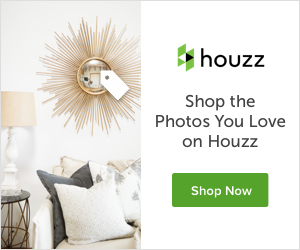 There are many faux options out there for some of these elements that you could use if you don’t have natural options. I have sourced them below. 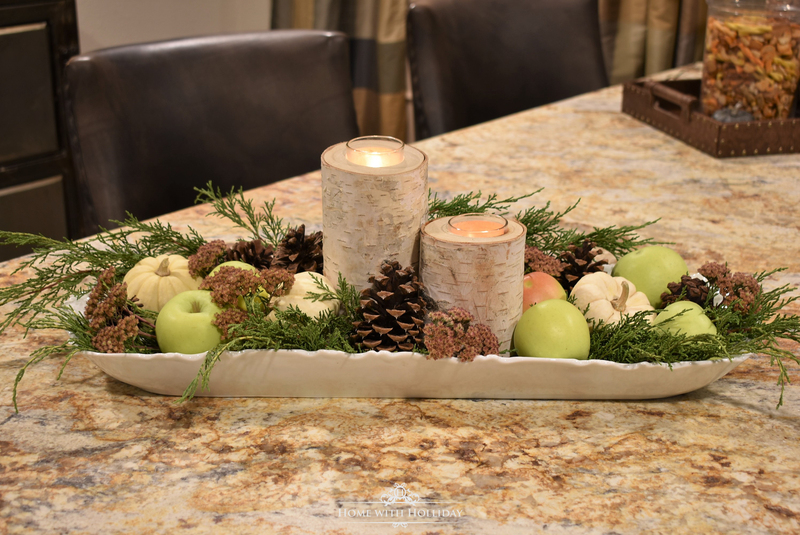 Thank you for stopping by to see this new fall centerpiece with green apples. Have you used fresh fruit in any of your centerpieces? If you haven’t, give it a whirl! Also, if you love apples as we do, I just shared a new post of the Best Apple Recipes for Fall. This is Lovely, Holly! I love the combination of apples, pumpkins, and pinecones with the evergreen! Very pretty! Thank you so much, Kim! I have so many apples I had to come up with something else to do with them! Thank you for stopping by! LOVE everything about this, Holly! The tealight holders (nice price for that first set! ), the apples, the pine cones! all of it! Just lovely! Thank you so much Julie!! It was super easy and quick to do! I am so glad you stopped by! This is beautiful. I love the color scheme. I’ve always loved the idea of using green apples in fall decor. Your centerpiece turned out beautifully, Holly! Pinning to my fall decor board. I love your sweet centerpiece! what an excellent use of the abundance of apples. Great ideas. I see I’ll need to buy those apples for my centerpiece. Great tip to head over to Cost Plus. Beautiful. Thank you, Sandra! We just picked our last apple a few days ago. There are so many great faux green apples out there. Thank you for stopping by!